The International Astronomical Union (IAU; French: Union astronomique internationale, UAI) is an international association of professional astronomers, at the PhD level and beyond, active in professional research and education in astronomy. Among other activities, it acts as the internationally recognized authority for assigning designations to celestial bodies (stars, planets, asteroids, etc.) and any surface features on them. The IAU was founded on July 28, 1919, at the Constitutive Assembly of the International Research Council (now International Council for Science) held in Brussels, Belgium. Two subsidiaries of the IAU were also created at this assembly: the International Time Commission seated at the International Time Bureau in Paris, France, and the International Central Bureau of Astronomical Telegrams initially seated in Copenhagen, Denmark. The 7 initial member states were Belgium, Canada, France, Great Britain, Greece, Japan, and the United States, soon to be followed by Italy and Mexico. The first executive committee consisted of Benjamin Baillaud (President, France), Alfred Fowler (General Secretary, UK), and four vice presidents: William Campbell (USA), Frank Dyson (UK), Georges Lecointe (Belgium), and Annibale Riccò (Italy). Thirty-two Commissions (referred to initially as Standing Committees) were appointed at the Brussels meeting and focused on topics ranging from relativity to minor planets. The reports of these 32 Commissions formed the main substance of the first General Assembly, which took place in Rome, Italy, May 2–10, 1922. By the end of the first General Assembly, ten additional nations (Australia, Brazil, Czecho-Slovakia, Denmark, the Netherlands, Norway, Poland, Romania, South Africa, and Spain) had joined the Union, bringing the total membership to 19 countries. Although the Union was officially formed eight months after the end of World War I, international collaboration in astronomy had been strong in the pre-war era (e.g., the Astronomische Gesellschaft Katalog projects since 1868, the Astrographic Catalogue since 1887, and the International Union for Solar research since 1904). The IAU counts a total of 12,376 members, professional astronomers from 96 countries worldwide. 83% of all individual members are male, while 17% are female, among them the union's current president, astronomer Silvia Torres-Peimbert. Membership also includes 74 national members, professional astronomical communities representing their country's affiliation with the IAU. National members include the Australian Academy of Science, the Chinese Astronomical Society, the French Academy of Sciences, the Indian National Science Academy, the National Academies (United States), the National Research Foundation of South Africa, the National Scientific and Technical Research Council (Argentina), KACST (Saudi Arabia), the Council of German Observatories, the Royal Astronomical Society (United Kingdom), the Royal Astronomical Society of New Zealand, the Royal Swedish Academy of Sciences, the Russian Academy of Sciences, and the Science Council of Japan, among many others. Since 1922, the IAU General Assembly meets every three years, with the exception of the period between 1938 and 1948, due to World War II. After a Polish request in 1967, and by a controversial decision of the then President of the IAU, an Extraordinary IAU General Assembly was held in February 1973 in Warsaw, Poland, to commemorate the 500th anniversary of the birth of Nicolaus Copernicus, soon after the regular 1973 GA had been held in Australia. In 2007, the Communicating Astronomy with the Public Journal Working Group prepared a study assessing the feasibility of the Communicating Astronomy with the Public Journal (CAPjournal). ↑ "IAU Secretariat." International Astronomical Union. Retrieved on 26 May 2011. "Address: IAU - UAI Secretariat 98-bis Blvd Arago F–75014 PARIS FRANCE" and "The IAU Secretariat is located in the Institut d'Astrophysique de Paris, 2nd floor, offices n°270, 271 and 283." 1 2 3 4 5 6 Blaauw, Adriaan (1994). History of the IAU : the birth and first half-century of the International Astronomical Union. Dordrecht: Kluwer Academic Publishers. ISBN 0-7923-2979-1. 1 2 Adams, Walter S. (February 1949). "The History of the International Astronomical Union" (PDF). Publications of the Astronomical Society of the Pacific. 61 (358): 5. Bibcode:1949PASP...61....5A. doi:10.1086/126108. Retrieved 20 April 2016. 1 2 "National Members". International Astronomical Union. Retrieved 11 October 2016. 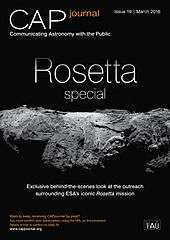 ↑ "CAPjournal Rosetta Special Out Now". Retrieved 28 March 2016.